Everybody loves tasting local recipes when visiting a new town or city, especially if this place is famous for its delicious cuisine. Well, Crete is considered an idyllic island not only because of its beautiful landscape and beaches, but also for its mediterranean gastronomy. Among the gorgeous dishes of Cretan Cuisine, Dakos constitutes one of the must-taste dishes. Actually, the majority of Crete’s visitors have tasted Dakos and some of them even decide to learn how to cook it in their own kitchen. Dakos, also known as “Koukouvagia”, is a fully nutritious meal made with simple, pure ingredients. The basic ingredient is barley rusk which is dipped into water for several minutes in order to soften, although after you let it dry it is still a little crunchy. Usually 3-4 medium sized rusks are needed. The next necessary ingredient for Dakos is cheese. There are various types of cheese that are used for this delicacy, however the most common one is myzithra, a creamy milk cheese (either by sheep or goat). Myzithra is kind of salty and it tastes like the Italian ricotta. Other types of cheese that are used in Dakos variations are anthotyro and feta; the first one has a neutral taste and it is very smooth, while the second one is very salty. Both of them are white cheeses, but anthotyro is a better choice for those who wish to consume less calories. Moving on to other ingredients, fresh tomato is essential for the delicious Dakos. The tomato can be grated or in pieces and is always put on top of the rusks and the cheese. But the maximum flavor of the Cretan Dakos is a result of the fragrant oregano herb, the salt and pepper, along with the Cretan extra virgin oil used in order to complete this dish. Sometimes, Dakos includes onion, fennel or local olives on top too. 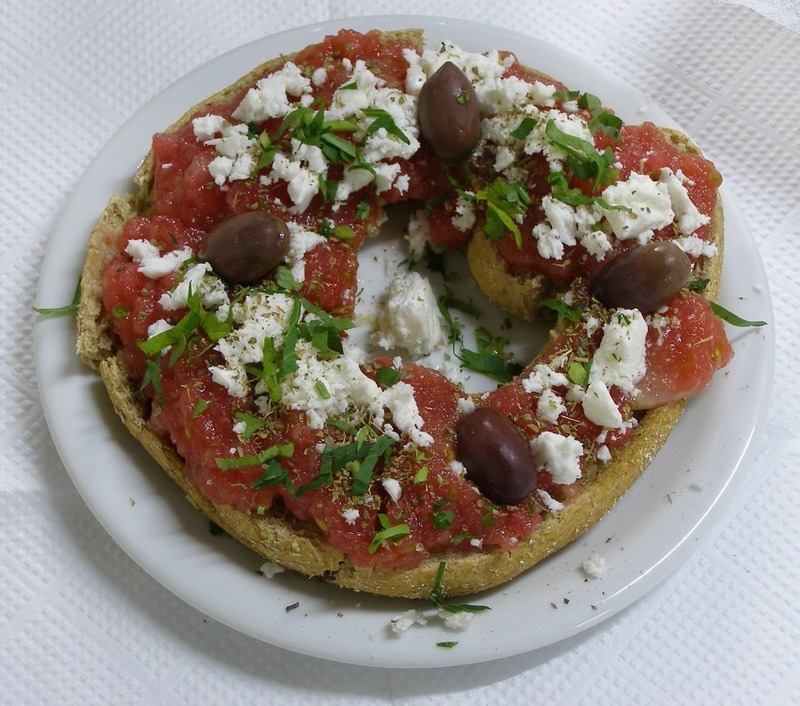 Dakos can be found in almost all Cretan restaurants and taverns and you can order it either as a starter or a main dish depending on your appetite. It is an ideal summer dish since it is a “cold dish”; the cool creamy cheese and the fresh tomato will refresh you for sure! Moreover, because of the variety of Dakos ingredients, you can order it instead of a simple salad. It is not surprising that the locals eat Dakos very often after all..!